March 19, 2017 0 comments on "How to Grow African Violets"
I’m sad to say that I had to kill two beautiful African Violet plants before I was able to admit to myself that even though I am normally capable of keeping houseplants alive, I know nothing about how to care for African Violets. Recently I had the opportunity to bring home a couple of baby African Violets, so I decided I should probably find out more about them before I kill two more. I was really surprised at what I learned. African Violets are very particular about their sunlight. I had already suspected as much. When my mom had my violets, hers always had beautiful flowers covering them. Even though I kept the plants alive for quite awhile, they hardly ever flowered. Apparently this is from having the wrong kind of sunlight. African Violets prefer morning sun. They like sunlight from the east, or north if east is not possible. Make sure they are near a window. If it is not possible to put your violets near a window, you can also use a grow light. They will not flower if they don’t get enough light. The way you WATER your African Violets is very important. This was the biggest surprise to me. You should never, never, water your African Violets from above. They like to draw water up from the base of the plant. Hmmmm. They make special pots for African Violets. I bought mine at Lowe’s. You can also order these self-watering pots from Amazon. The planter has two pots, one sitting inside the other. You place water in the bigger container, and then place the smaller pot with the violet in it into the larger pot. The water slowly seeps through the smaller pot to water the violet. Apparently you should also never water your violets with cold tap water. Set aside a container of tap water for a day or two before you water your plants. The water will be room temperature and the chlorine in the water will have dissipated. When you are planting African Violets, it is also important to use the correct soil. You can buy a special potting soil made specifically for African Violets. They also make special plant food for them, but according to The Plant Expert, Jobe’s inexpensive plant food stakes work just as well. So I am going to be brave and start again. 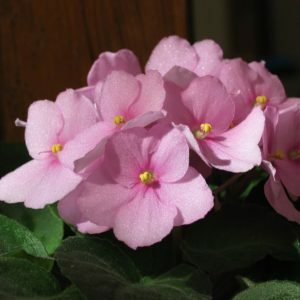 Hopefully by following these tips I will be able to once again grow flowering African Violets.